Web scripting brings your website to life in record time. 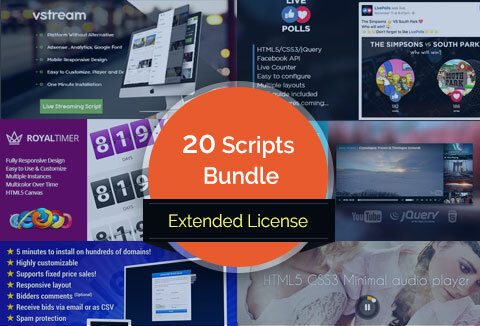 This web scripting bundle is highly scalable, robust and user-friendly and can give your websites a very competitive advantage. The player is fully responsive and will resize intelligently. It also runs smoothly on mobile devices. The player has a custom designed interface. You can not only customize its appearance but many other options and settings too. RoyalTimer comes with flipping animation. You can change the flip background color or use a static background color. This URL Shortener is simple and easy to use. It is similar to Google URL Shortener which comes with the features like adfly. You can integrate analytics with URLs to see the performance report. It comes with a user-friendly feature. Vina Online Exam System is a web script which is written by CodeIgniter framework. It uses MySQL for storing all the related data. It also uses Twitter bootstrap v3.x for enhancing GUI and supporting responsive design. And JQuery AJAX for backend. The main purpose of this script is to help you conduct online tutorials and exams. Users can also view their results, share their results with friends on Facebook, Twitter, Google Plus. Moreover, they can also download certificates. Stream Facebook Live Polls on your Facebook Page. This script provides you with a real live reactions counter, with the help of Facebook API. It comes with a clean HTML5/CSS3 template with multiple layouts/reactions. No coding skills required, you can customize it without writting a single line of code. You'll also get a PDF guide explaining how you can stream line a Facebook Live with this script. Google Adsense, Analytics, Fonts Ready. Easy to Customize Player and Design. Watch Streams From Any Device. Social Share, Likes, Add to Favorite, Playlist, Subscribe. Don't require any programming skills , Just Copy/Paste. Build video sharing community in minutes or less, with the best video script on the web. Full SEO optimization, easy control panel. Built with google material design - this means it looks great on desktop and mobile devices. Fast and easy to use admin panel. Great code and design quality. For higher functional demands, there are lots of functionalities, like md5 encryption, IP blocking, limiting number of attempts etc. Uses CodeIgniter framework which is more secure and robust. Ajax powered (no page reloads). Save your bandwidth! jRollingNews is a jQuery plugin that helps you display any RSS feed. If you want to display custom content, jRollingNews makes it possible for you. It contains more than 20 parameters to help you customize the look and behavior to fit your needs. Dashboard - The dashboard mainly contains the links to the different functions that the system user will be performing, Also the dashboard shows an overview of the general system statistics like total hours worked, completed projects, invoices created etc. Billing - Helps the user to view all the invoices and also create new ones. Projects - Allows one to easily, add, edit and delete system projects. Client Section - Your clients can view their invoices and projects and make payment via paypal.